But an elegant looking cupcake none the less. 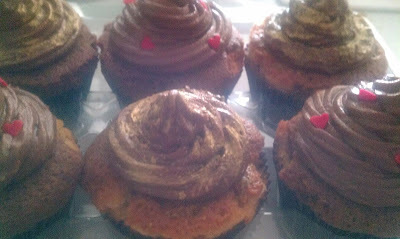 My Mum's birthday is tomorrow, and I recently purchased some super special, posting boxes for cupcakes.... Soooo experiments were to be had! I put them in the post this morning, I will be on the phone to find out how they looked when she receives them tomorrow, and whether or not they survive their 230 mile trip! I chose to make my Mum's cupcakes chocolate and peanut butter flavoured as it is one of her favourites, we share a love of peanut butter m & m's and peanut butter cups (both of which are too be found very few and far between in the UK, and are a nightmare to get hold of, very disappointing!). So it seemed like an apt idea. Buuuuuut, I couldn't just make a normal, plain ol' cupcake! Oh no. So .... 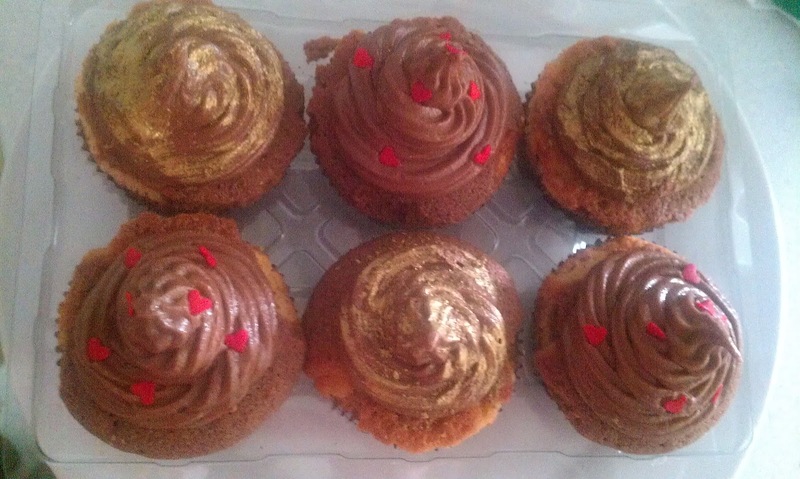 I made peanut butter cups, and put them in the middle of some swirled peanut butter cupcake and chocolate cupcake mixes and baked up Swirly Chocolate and Peanut Butter Cupcakes, with Peanutbutter Cup Surprises! 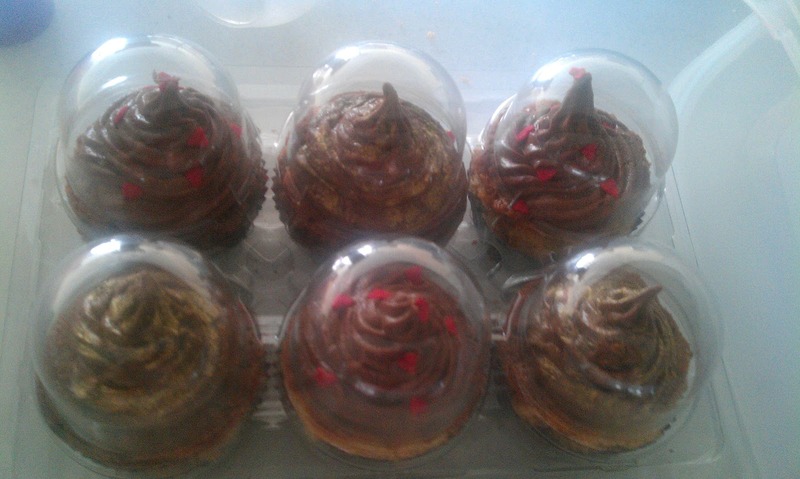 If you like chocolate and peanut butter, or if you are a fan of Reeses PB cups, and you like cake, well, I tell you, these cakes are gooooooood! I started out by making these, as I wanted them to be solid and set, before I baked the cake, ready for them to go all melty again once they went in the oven. 1. Set up 18 very small baking cases on a tray. 2. 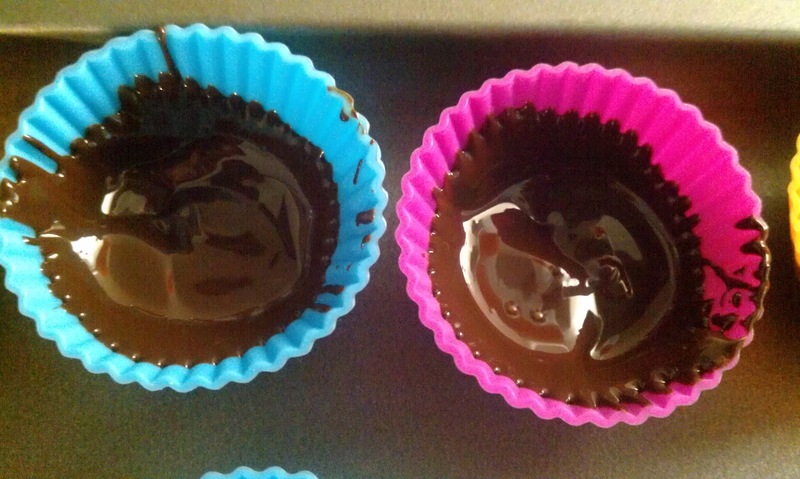 Melt half of the dark chocolate and put a half teaspoon to 1 tsp of the chocolate into each baking case. Tip the case, so that the chocolate runs up the edge of the cases all the way around. Set aside to harden (you can place in the fridge for a short time to speed this up if you wish). 4. Take teaspoon sized amounts of the peanut butter mixture, and roll into balls, then flatten into discs smaller than the width of the baking cases you are using. 5. Place these discs into the chocolate coated baking cases. (If you have extra peanut butter mixture you can either make extra cups, or just add the leftover peanut butter mix into your PB cupcake mixture later to add an extra peanut buttery kick). 6. Melt the remaining dark chocolate, and coat the peanut butter middle with it. 7. Leave to go completely solid (again you can use the fridge to speed this up). 8. Once they have hardened completely, you can turn them out from the cases (and sneakily munch a few that look, ummm below par, or whatever excuse you want to use!). 1. Preheat the over to 170 c and place muffin cases into a 12 cup muffin tray. 2.Cream together the margarine and sugar. Whisk in each egg, one at a time, thoroughly mixing between each egg. 3. Add the vanilla essence, baking powder and flour to the mixture and mix well. 4. Split the mixture into two separate bowls, half in each. Add the peanut butter to one of the bowls and mix in well. Add the cocoa into the other bowl and mix well. 5. 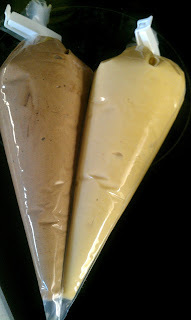 I placed each mixture into a separate piping bag, and taped the two bags together to fill the baking cases with swirled mixture (as on the left). 6. Swirl in the two mixtures to approximately 1/3 to 1/2 the way up each muffin case. 7. Place one peanut butter cup upside down in each muffin case, pushing down into the mixture slightly. 8. 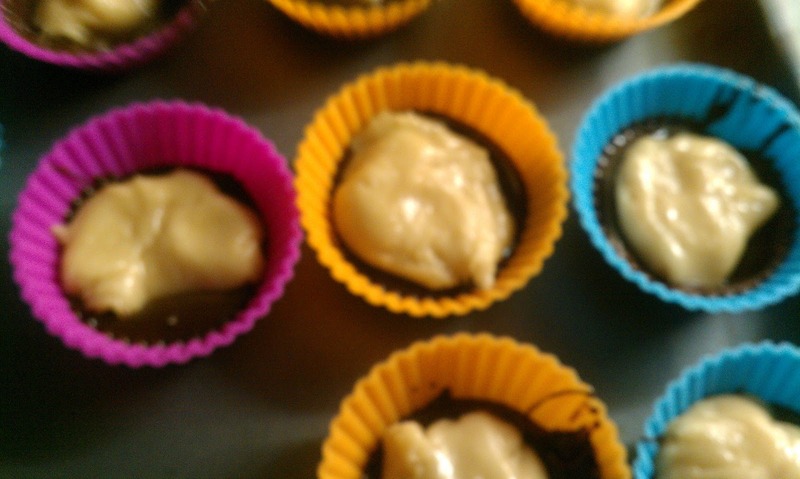 Cover the peanut butter cups with more swirled mixture to slightly coat the peanut butter cup. 9. Bake for 20 minutes or until lightly browned on top, and the sponge springs back up when pushed down gently. 10. Once baked leave to cool completely on a wire rack. In the mean time prepare the icing. 1. In a large bowl mix together the butter, icing sugar and milk to form a basic buttercream icing. 2. Sift the cocoa into the bowl and mix into the icing. 3. Add more milk or icing sugar to get a consistency that will flow freely through a nozzle in a piping bag, but is thick enough to hold its peaks. 4. 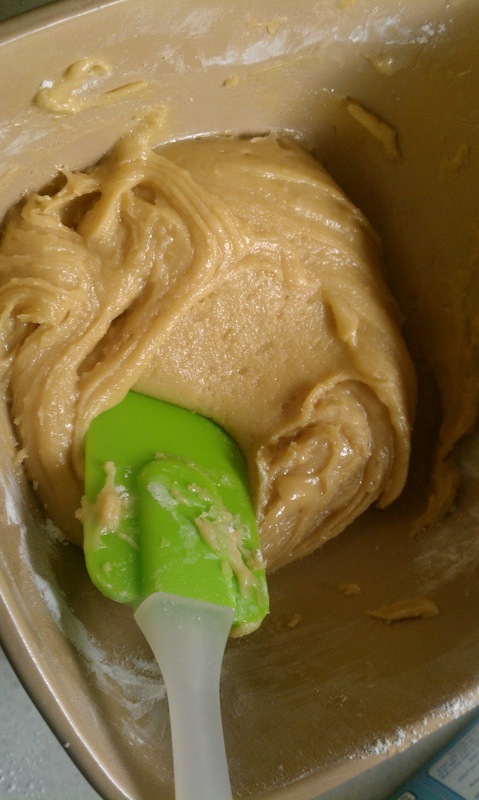 In a separate small bowl mix together the margarine and peanut butter to form a slightly runny paste. 5. Add the peanut butter mix to the chocolate icing. Swirl together, you can barely mix to get a rippled effect, or you can fully mix to get a monotone icing (sadly I swirled a little too much, so when I added it to the piping bag, the peanut butter vein was lost). 6. Pipe onto your cooled cupcakes and decorate with whatever you fancy! A Reese's miniature peanut butter cup would be perfect. I hope my Mum enjoys them as much as I did! A yummy treat indeed. Thanks for reading!